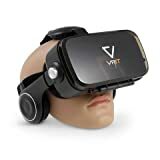 • The VRIT V2 headset with an [OK] button, allows you to control the screen to shoot, confirm, next page and other functions without using Bluetooth devices. You won't need to remove the phone to achieve pause/play function when you are immersed in your 3D VR world. This button can also answer a call to your phone with a single press. • VRIT has total immersion with a 120° large field of view, which is closer to the human visual angle, to ensure immersive reality. The Diopter Adjuster provides a 0°- 800° myopia and 0°- 400° hyperopia, which means no need to wear glasses, and can easily adjust the focal distance while wearing the headset. The unique VRIT V2 design has 6 airflow pores to insure proper air flow and heat reduction throughout your experience.